Algajola Beach – about half way between L’lle Rousse and Calvi on the Corsican north west coast is the small coastal town of Algajola. The town is worth a visit in its own right, steeped in History, the town was founded by the Phoenicians, but there is some evidence to suggest that prehistoric man also settled in the area. It was a Roman port, only to be abandoned in the 6th Century; re-established in the 12th Century; and changed hands a couple of times due to the odd war and treaty until the mid-18th Century. During these time a fort was built and still stands today along with the ruins of a few other buildings that are monument to the town’s history. Despite this rich history the locals preferred the place as small fishing village during the quieter times. Algajola beach starts from the town and stretches for about a kilometre towards L’lle Rousse to the next small headland. The beach is one of those beaches that you are likely to find listed in the top 10 beaches of Corsica. You can never be sure who or how these lists are compiled but in any event this beach is one that should be on such a list. This is because like most other beaches in the area, it’s got sparkling white sand, crystal water, a great outlook and a fabulous sunset that highlights the town, making a real jewel of Corsica. The sand is a mix of ground granite and coral being a little coarse which means you will leave it on the beach, unlike the fine magnetic sand you will find on other beaches. The beach during summer is quite busy. 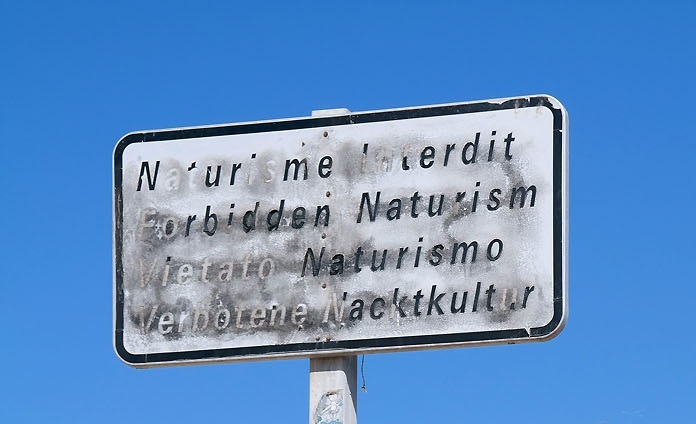 Although there’s a sign in 4 languages that naturism is prohibited. The naturalist section is about three quarters of the way along the beach, and ironically not far from the sign. This section although not designated is basically defined by being the area in front of the tree line that offers some shade. Most people will be naked but you are also likely to have a few textile beach goers in this area as well. This seems to be the Corsican way with a mix of both types of beach goers. In the textile area there are water sport activities available including jet skis, windsurf equipment, kayaks, and boogie boards and the diving and snorkeling is spectacular. However, these are strictly not for the nudist on this beach. The beach has a great relaxed atmosphere with the naturalists there to enjoy the sunshine and atmosphere. The crowd is made up of family groups and couples with the odd single person. There is the odd lurker but as with most other long European beaches people do walk the length of the beach at the water’s edge, but I don’t suggest that you do this naked. The water is generally calm but and very safe but during autumn and winter the beach has some good surfing conditions but these can be unpredictable. You may see the odd optimistic holiday maker during summer practicing their paddling skills on a surfboard in the very small swell waiting for a non-existent wave. The beach has a very good restaurant that specialises seafood at the far end that stays open late into the night during the summer and a few other smaller eateries on the road just behind the beach. A small supermarket on the edge of town has most things you would need and if you drive there are a couple of roadside shops on the way selling local Corsican produce. A small hotel is also on the beach should you wish to wake up on the beach. Rail: – Catch the train that runs between Calvi and L’lle Rousse. There is a station right behind the beach. Cross the road small road onto the beach. 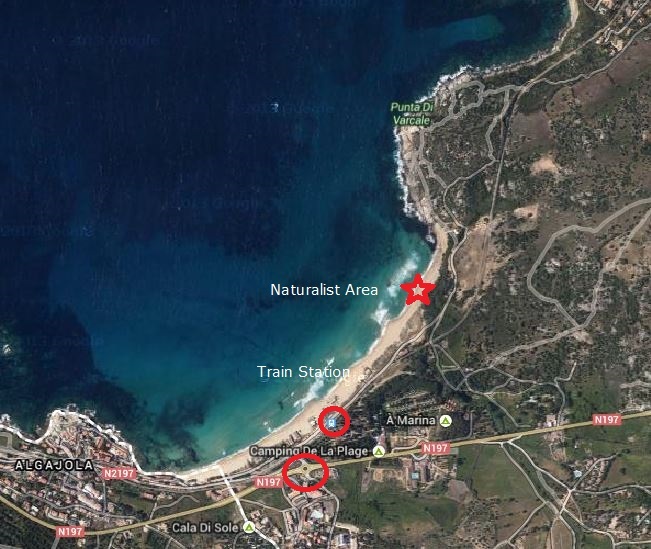 Car: – From either Calvi or L’lle Rousse drive towards Algajola, follow the signs to the round-a-about on the N197, cross the railway line turn right and drive along this road for about 500m, past the hotel and a small restaurant or you find a small car park. If that’s full continue on and you’ll find another car park. The road does have a few speed humps and the restaurant does have some thick rope across the road that will slow you down.